Headaches affect every person at least once in his life. There are different kinds of headaches and different reasons they develop. For instance, stress, anxiety and lack of sleep cause tension headaches. A sinus headache, on the other hand, is caused by a mucus build up or nasal congestion due to colds. You can easily treat headaches with over-the-counter medications, but a longer and more lasting remedy would be to rely on natural things that can reduce the frequency of your headaches. Remove foods from your diet that can cause headaches. These include foods high in caffeine, sodium and fat, as well as alcohol and cheese. These foods can cause fatigue, dehydration and slow metabolism, making you prone to hypertension. Drink water mixed with lemon juice. Add two ounces of lemon juice to a glass of water. Lemon will prevent your body from building up too much uric acid, which can cause your system to experience chronic headaches. Eat a lot of almonds. Almonds contain salicin, which induces pain-relieving effects, making it a natural alternative to aspirin. You can munch on almonds if you experience acute headaches, and the salicin will lessen the pain in just minutes. Drink caffeine-free chamomile tea before going to bed. Chamomile is a mild and effective relaxant that will help relax muscle tension that can cause headaches. Stretch every morning. Stretching just after you wake up promotes blood circulation and proper breathing. Stretching in the morning will help eliminate symptoms of headaches due to hypertension and stress. Place a cold compress on your head for at least 30 minutes. This will relieve the pain caused by the headache. Placing wet tea bags on your eyes can also help. Tea is also good for soothing the skin and increasing blood flow. Do breathing exercises. Breathing exercise require you to inhale deeply and exhale slowly. Doing breathing exercises while engaging in mild exercise such as a brisk walk can bring favorable results. People with poor cardiovascular and respiratory health often suffer from headaches, so breathing and physical exercises can address both issues. Turn off the lights. 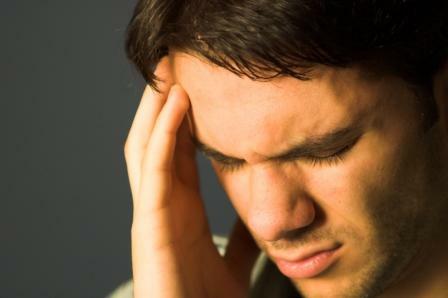 You might notice that people who suffer from headache tend to be sensitive to light. Shut off the light or close your eyes and lie down. If you find it uncomfortable to lie down while having a headache, just sit in a dark room and do breathing exercise. Take cold showers. The cold temperature can ease the pain the headache causes as well as relax the tension from the muscles. Get the right amount of sleep. Lack of sleep is one of the leading factors why people get headaches during the day. You need to give your body the right amount of sleep every day—preferably eight hours or more with the lights off.